I have decided to focus on one driver during the summer break. 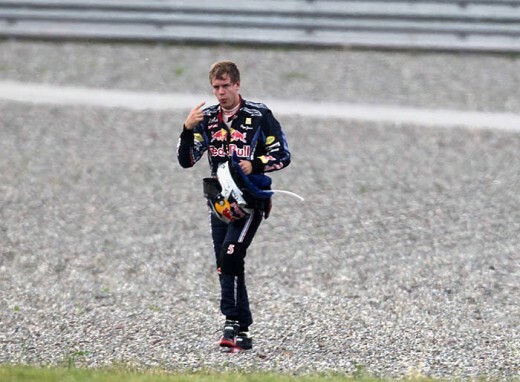 Namely Sebastian Vettel. And it is because his tale is a peculiar one of mechanical bugs, opportunities lost and teammate rivalry. I first noticed him when he was a test driver for BMW-Sauber in 2006. Back then there were no testing bans. Not like today anyway. And many test drivers got a run in the Friday sessions. Sebastian had just turned 19 years old when he got in the seat of the BMW at Free Practice 1 in Turkey. At the end of that session he was just a good tenth behind Heidfeld in the other BMW. On FP2 however he was on top of the timing sheets. That got my attention I remember. Even if its only practice it takes skill to be at ease so quickly in a real F1 car on a real track. At the next venue, which was at Monza, he did it again. Topped both FP1 and FP2 this time. Well ahead of new boy Kubica who had taken over after Villeneuve. Little did the kid know that he would get his first win just 2 years later on the very same track. But the foundations were laid for a career into the big leagues and just 4 races later he had replaced Scott Speed at Toro Rosso and was now a full time F1 driver at 20 years of age. He has been named Baby Schumi and even though he doesn’t particularly want that comparison, the similarities are there. Taken from Wikipedia: “Like Schumacher, Vettel grew up in a small town with an everyday background — Schumacher’s father a bricklayer and Vettel’s a carpenter. 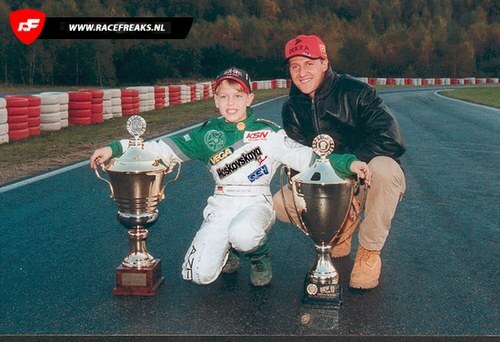 Both had their first taste of racing at the Kerpen karting track near Mannheim, not far from the Nürburgring. Vettel began driving in his garden lapping the garden many times, not even stopping to eat or shower. [He] says his passion for cars was nurtured by watching Schumacher compete, much like what he is doing now”. How strange it must be to race alongside his childhood hero. And beating him every single race. 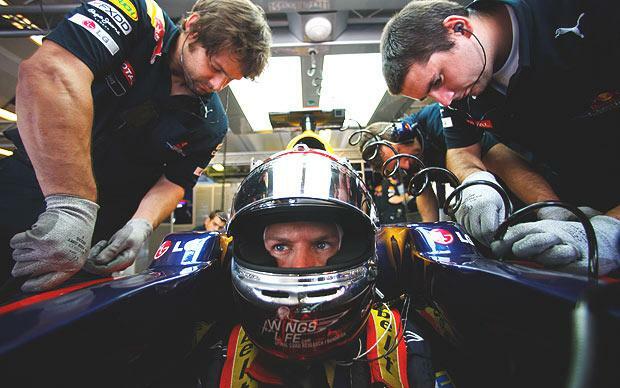 2009 was a coming of age year for Vettel. He was now in possession of a car capable of winning races on its own merit (as well as Sebastians). His 1-lap pace in qualifying was another strong feature of the young German. 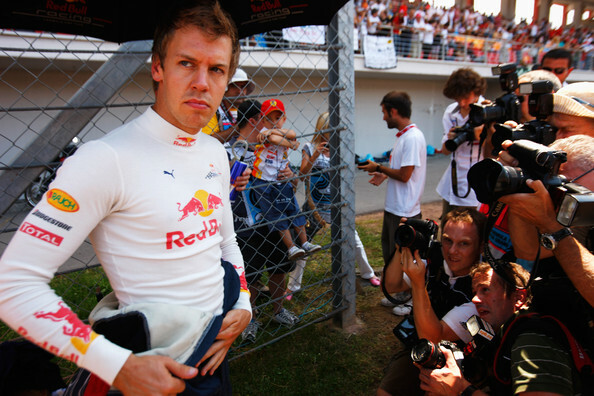 We saw him make a few mistakes like the run-in with Kubica at Australia where he threw away a sure podium. Yet he managed to win 2 races halfway through the season (like he has done at this point in 2010) and that up against the superior Brawn car. At the end of 2009 he had won 4 races and had come 2nd in the championship. So he had proven himself as a contender and a force to be reckoned with. 2010 rolled around and it quickly became clear that there had been a switch of fortunes. Now Vettel was in possession of a “Brawn” car so to speak. As dominant the one-season-wonder car was in 2009, just as strong the Red Bull car seemed to be. Mostly displayed by a fierce qualifying pace. More than half-way through the season and the competition doesn’t seem to be any closer than they were in Bahrain. And yet Vettel is currently third in the championship. That doesn’t add up. Picture someone being explained the incredible pace of the RB6 and then revealing that the young prodigy of 08 and 09 is only 3rd in the standings. “Why?” would be the first question asked. Here is where we delve into the numbers and the events of each race. My own personal assessment and opinion will be shared. I will judge the faults that led to the loss of points, mechanical or human and calculate the total amount in the end. It is purely hypothetical of course as anything can happen in racing. But I have tried to view it from the most likely scenario taking as many factors into account as possible for me. So buckle up. Qualified on pole. Race finish: 4th. 12 points. Issue: A faulty spark plug. It was a GP where Sebastian controlled his pace. The Ferraris were close behind but never a real threat. The spark plug issue acted up during the second half of the race and he had to let 3 cars pass him. A sure win and 13 points lost. Pole position (even with a messy lap). Race: DNF. 0 points. Reason: A faulty wheel/brake. He was leading the race comfortably and unchallenged. Suddenly something snaps under braking and he goes off into the gravel trap. A sure win and 25 points lost. 3rd in qualifying. Lap done on full wets while pole sitter Webber was on intermediates. Race: 1st. 25 points. Gets a great start and practically holds on to the lead from there. Controls his pace keeping a safe distance to his teammate. Secured pole position. Race: 6th and 8 points. Issue: Bad start, lost place to Webber. Wrong tire choice. Not a sure win at all. But a 3rd is more than likely if not for the bad tire choice getting him stuck behind Kubica. 7 points lost. Qualifying: 2nd. Race: 3rd and 15 points. Issue: Brakes almost gone at the end of the race. Had to make an extra pit stop due to this, which dropped him to 4th. Lewis’ crash promotes him to 3rd. Red Bull actually wanted him to retire from the race. So severe was the problem. Points lost in Spain: 3. Would have been 2nd due to Lewis’ crash had he not made the – in hindsight – unnecessary pitstop. 3rd on the grid. Finished 2nd in the race. 18 points secured. Issue: Hampered by a crack in the chassis of the car. Points lost: Hard to say. Had a non-perfect chassis so he might have secured pole with a perfect chassis but Webber was very strong here as well. So no points lost. Points lost: Tough to call. He has to share blame with Webber for the crash even though some say it was his fault alone. Which it wasn’t. Anyway, he lost at least 18 points here. But Im going to say he lost a sure win and 25 points, all things considered. Had he gotten the pole he was so very clearly set to take, then the tangle with Webber would have never happened. Qualifying: 2nd. Finished 4th. 12 points. Issue: Gearbox problem in the race. Points lost: 3. Had to seriously back off due to the problem. If he could have kept the pace up then he had a clear shot at the Ferrari in 3rd. The McLarens were untouchable though. Pole position. Race: Won – 25 points. He escapes a puncture from contact with Lewis in the start. He also escapes any trouble with the safety car after Webber went flying over Heikki. Everything fell into place and Vettel was untouchable. Qualifying: Pole position. Race: 7th. 6 points. Issues: A bad start and consequently a puncture on lap 1. This time there was no luck in escaping the puncture. Points lost: 19. Did one heck of a fight back from last to 7th. The bad starts were reported by Red Bull as a clutch problem. Got pole position yet again but finished in 3rd and got 15 points. Reason: Another bad start. Not on pace but could have won. Clutch problem confirmed reason for bad starts says Red Bull. Points lost: Possibly 10 points. But lets give Alonso the benefit of the doubt and say it at least was a potential 2nd place for Vettel. So 3 points lost. Qualifying: Pole by 4 tenths of a second to his teammate in 2nd. Race: 3rd. 15 points. Reason: Drive-through penalty for not keeping the correct distance to the car ahead during the safety car. 10 points lost for a sure win. His own doing in essence – but the team radio wasn’t working at the time so that his team could inform him that the SC was going in. So this can partly be written off as another reliability issue. Granted, I could have done an article like this for the other drivers too. Hamilton for example has had a couple of breakdowns too. And Alonso had his share of incidents and mistakes. 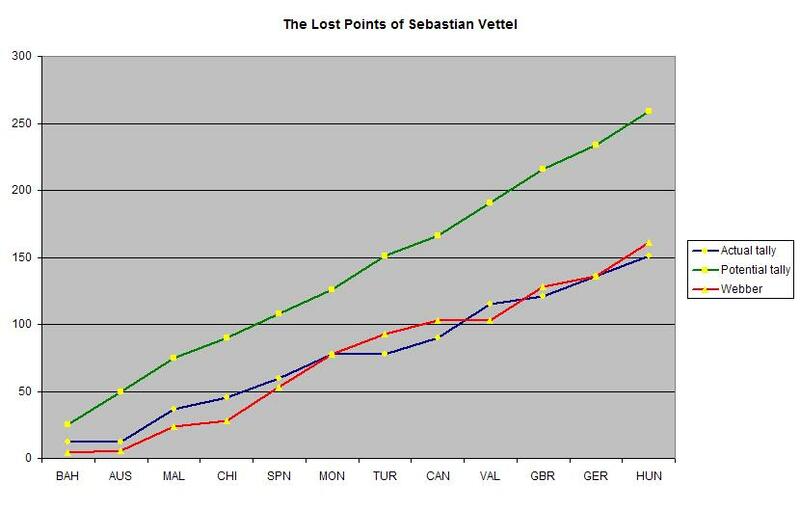 But Vettel is the most extreme in this case and therefore the most interesting. What is pretty baffling is that the Red Bull comes out in second as the most reliable car this season. Only beaten by Ferrari who has missed just 3 laps of racing out of 1474 laps so far – which is astonishing. That is equivalent of 99,8%. Red Bull is at 93,1% and 1373 laps of 1474 completed. But the thing here is that it is measured by laps completed in the races and does not take into account mechanical issues that forces the driver to slow down in order to complete the race. Or technical issues in qualifying that hurt the drivers chances in the race. I want to make a quick comparison with MotoGP if I may. If any of you follow this sport, I am sure you have seen that Jorge Lorenzo is doing something very special this year. He is on the Yamaha with Rossi as his teammate and 10 races in, he is 15 points from a perfect score! He has finished in 2nd only 3 times. The rest is pure wins. My point is: Vettels season is as imperfect as Lorenzos is perfect. He should have been able to see the WDC crown by now. But instead he has a lot of work to do. There have been some driver errors but I would say that 80% is down to reliability and 5% bad luck. 7 pole positions has only transformed itself into 2 wins so far. In comparison Webber has 4 poles and 4 wins. Not all on the same races of course but it tells a story. You can say a lot about Webber and I do. But he has grabbed the chance for a win whenever there was one. He has been the one who has benefitted the most from Vettels tribulations. Will this continue? What am I – some kind of genie? Alright, I will have a go at it. Here is my prediction: It will not. Spa may be a problem for the Red Bull car but from then on I think we will see a Sebastian with gritted teeth and his pole positions will transform into wins from now on. Most importantly for Sebastian: He is clearly faster than his teammate again compared to the slump around Monaco and he is not going to let Webber take any more bites of his sandwich. So bring on Spa. Its gonna be an exciting run to the finish! Soren says: Im off to Rally Germany. See ya!! Cheers… Keep it up Soren. It seems like this is another Kimi case in bloom…is it only because I’m the one supporting them? My sense of prediction is exactly like Roger Federer calling a line shot [which I think is pretty bad]…I dunno. Well, it does seem that he’s squandering a lot of points, the poor guy. But there are still 7 races, and if that’s not enough either, there’s always next year. Remember, he’s only 23. Absolutely. This story reminds me of Kimi in those Mclaren cars. Here’s hoping he has a li’l more luck on his side from now on, he deserves it! Also, I read about Berger saying Rosberg is just as talented as Vettel. Your views on that? Berger said that? Well, I remember following Rosberg with interest in his first season in 06 and qualifying 3rd in his second race with the Williams. He has been a bit out of the spotlight because of a midfield car. But he has shone every now and then and shown us a glimpse of his talent. I think the pairing with Schumacher has done his career good. Opposed to what everyone thought before this season started. He certainly deserves a race winning car. As good as Vettel? He might very well be.